Should you get Google's Allo? The answer is: Yes! As a messaging app, Google's new Allo isn't great. Specifically, it's functionally indistinguishable from any number of apps that have been around for years. But there's one reason why you should want to use Allo every day: artificial intelligence. There are dozens of messaging apps, and each has its own unique list of features. For example, iPhone users may feel compelled to choose between Apple's iMessage, which recently gained the ability to run iMessage apps, and Allo for iOS. So for the sake of understanding Google's new messaging service, let's talk about how iMessage compares with Allo. Apple's iMessage service and Messages apps are generally more elegant, polished and appealing to use than Google's Allo. A range of recently launched features make iMessage fun, such as "invisible ink," "gentle," "loud" and "slam" effects. Mac users have a desktop version of Messages, which integrates seamlessly into the mobile versions. I use iMessage via my MacBook Pro, iPad and iPhone. 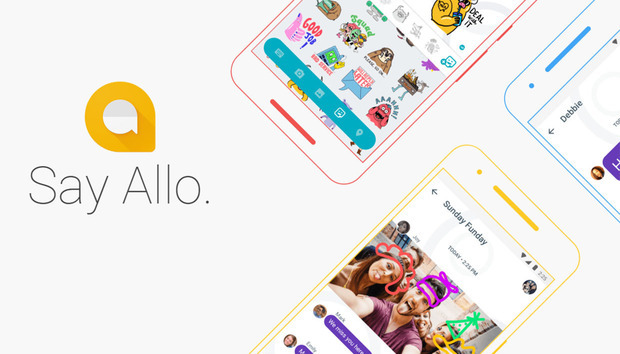 Unfortunately, you can use Allo on just one phone. Strong encryption for messages between two iMessage users is default and automatic, making iMessages more secure because no explicit action is required to gain full benefit of the end-to-end encryption. Edward Snowden says: Don't use Allo. With Allo, users need to choose end-to-end encryption by using an Incognito mode. Google had previously said it would store only some user messages on its servers, but changed its tune by launch time, saying the company will store all messages unless actively deleted by users or initially sent in Incognito mode. In reality, that means most users will leave all messages on Google's servers forever, and those conversations will be available to law enforcement, the NSA and possibly hackers some day. On the plus side, Google uses the Signal Protocol for end-to-end encryption while two Allo users have an Incognito conversation, which is very good encryption. Also: While you can manually delete conversations you have with other people, you can't delete conversations you have with Google's Assistant. Because stored data is necessary for Assistant customization, Google doesn't give you Assistant or Smart Reply features in Incognito Mode and doesn't let you delete Assistant conversation data, to the best of my knowledge. Finally, Apple's entire approach to communication is very clear, while Google's is muddled. Apple has three properties: email (Mail), Facetime (video and voice calling) and iMessage (messaging). Nobody's confused about any of this. Google, on the other hand, has two cloud mail clients (Gmail and Inbox), three voice and/or video apps (Google Voice, Hangouts and Duo) and two messaging apps (Hangouts and Allo). And most users aren't sure which, if any, are defunct or soon to be phased out. While you can achieve the equivalent of ephemeral messages with iMessage by installing one of several apps, the option for self-destructing messages is built in to Allo, but only in Incognito Mode. When you enter into Incognito Mode, the default is set for the message to self-destruct in one hour, but you can change that to any of several times within a range of five seconds to one week. You can also set the message to never expire. Google Assistant will do searches within a chat. Apple's iMessage is for Apple hardware and operating systems only. But Google's Allo runs on both Apple platforms and Android. So iPhone and Android users can use Allo to chat with each other without resorting to SMS. The best thing about Allo is the Assistant, which is a front end to a kind of next-generation Google Now. Today, Allo is the only place you can use Assistant. Later this year, Google is expected to release an Amazon Echo like device called Home, which uses Assistant through voice interaction. By addressing the Assistant directly in Allo, you can ask it to show your pictures, which it grabs from Google Photos. You can say, for example, "show me pictures of dogs," and it will show you your own dog pictures from Google Photos with an option to see other peoples' dog photos from the web. It will also reach into your Gmail or Inbox account. By telling the Assistant: "show me emails from John," it will show you the most recent two, with other options like "My emails from yesterday." When you ask for your upcoming flight information, the Assistant pulls data from your email and shows your flight details in a formatted list. You can tell it to show your meetings scheduled for tomorrow, your next meeting or your schedule on Monday, and it will do all that, taking the information from Google Calendar. You can also add items to the calendar from inside Allo, but this feature didn't work for me -- nor did the setting of timers and alarms. You can also launch Google searches from Allo. It will either show you a sample of results in Allo, or it will kick you over to your mobile browser and the Google Search site. Best of all, the non-personal Assistant results can be summoned from within a group chat, and everyone involved will see them. You can also type "@google play games" and Google will offer you games that can be played by yourself or with groups. Google Allo offers two distinct and very different kinds of artificial intelligence. In addition to Assistant, you also get Smart Reply. Smart Reply debuted for Google Inbox on Nov. 3. This simple feature is backed by serious machine intelligence. In Allo, it gives you one or more options for replying. Tapping on a reply both selects and sends the reply -- literally a one-tap operation. Replies tend to be general, short and casual. "Ok, thanks," "Sounds good" and "Will do." When my son and I first started using Allo, we both impulsively responded with Smart Reply options. We had a longish back-and-forth conversation using nothing but Smart Reply -- essentially enabling Google to talk to itself through us. Smart Reply is sometimes smart, sometimes not so much. It suggested that I reply to a male colleague: "Thanks, sweetie." Tempting, but I went ahead and typed a reply myself. Unlike the Smart Reply feature in Google Inbox, the Allo version offers replies to photos and emoji, with Google A.I. looking at and "understanding" the content of images to come up with a reply that could be considered "smart." I sent a photo of a pizza to my brother-in-law, and he was offered Smart Replies of "I love Italian food," "Yum" and "That looks good" -- then offered him links to nearby Italian restaurants. This digression into pizza restaurants is a "preview edition" of the Google Assistant, and it's clearly a work in progress. Google promises that these replies will evolve to match your style. "The more you use it, the more it improves over time," according to the official Google announcement. You may have heard in May that Google Assistant would launch with Allo. Most users assumed that Assistant would be like another human on your list of contacts, and by addressing the Assistant with questions, you'd get Google Now like answers. But it may surprise you to learn that Assistant listens to your conversations with others, and interjects with helpful information. That's right: Google's A.I. follows along with all your conversations, "understands" all your photos and emoji and then "participates" in the conversation with suggestions of all kinds. If you want my opinion on whether you should install and use Allo, I can tell you the answer is: Yes, of course you should. There are legitimate reasons (security, convenience or preference for another messaging app) to not use Allo for communicating with humans. But the Assistant alone is enough reason to use Allo. To have the updated Google Now in an explicitly conversational interface is fantastic. If Google's Assistant isn't the most powerful A.I. virtual assistant available, it's certainly the most usable, precisely because it's built right into Allo's messaging conversational UI. So forget messaging. Allo is at least an indispensable, all-purpose A.I. bot -- and there's nothing else like it out there.